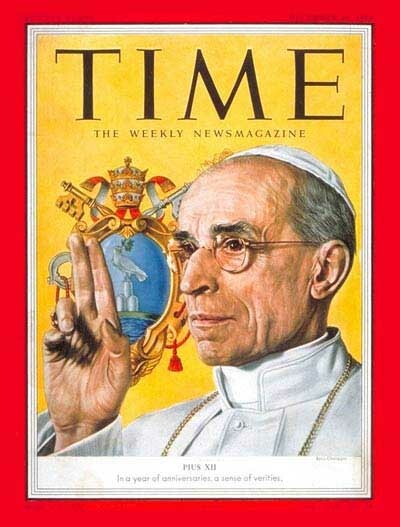 It is said that the gesture of Pius XII shows his desire to end the Second World War. "Nothing is lost in peace, all can be lost with war." 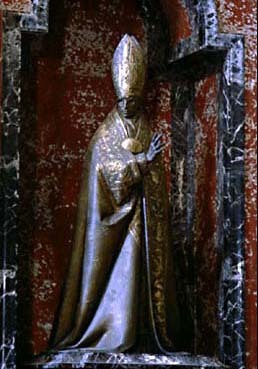 The statue of Pius XII (1939-1958) was commissioned by the Cardinals he had created, and made by Francesco Messina in 1964. The Pope is shown blessing the faithful, clad in papal robes. His gesture also seems to express his desire to put an end to the scourge of the Second World War, while his expression seems to reiterate his famous sentence: "Nothing is lost in peace, all can be lost with war". 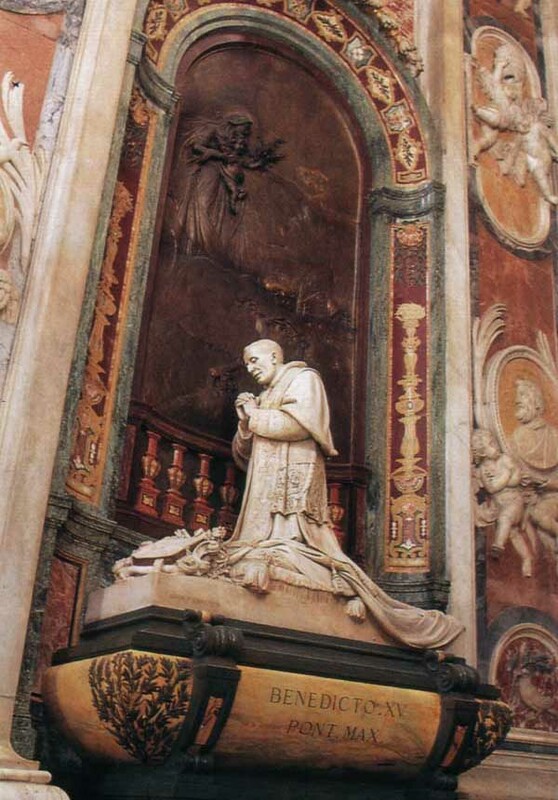 Pope Pius XII (1939-58), who guided the Church during the difficult days of World War II could not fail to be honored in the Basilica he loved so dearly. The Cardinals ab eo creati ordered a monument to him that was made by the famous artist Francesco Messina in 1964. 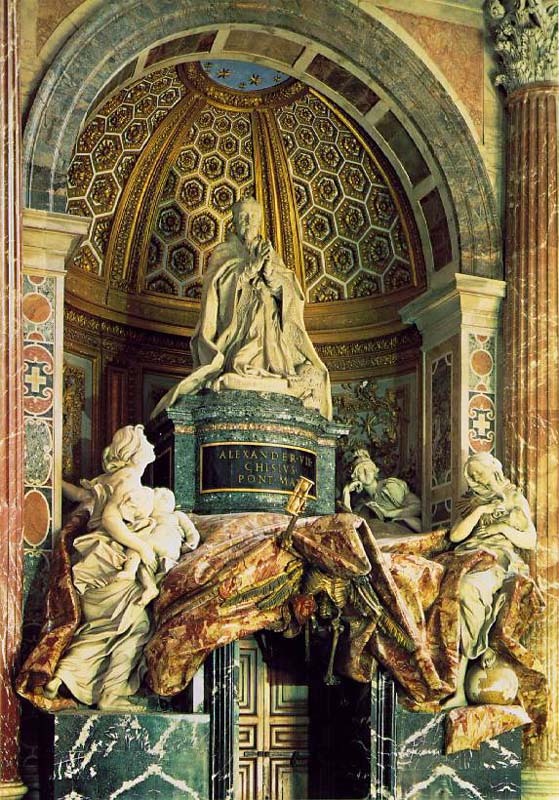 A high pedestal further augments the already tall figure of the pope who stands majestically in the robes of his authority and spiritual power. His far reaching gaze extends to the horizon and imminent war. With his famous gesture, hand raised in blessing, he symbolically tries to stop the oncoming disaster. His prophetic words to the heads of state before the outbreak of the war have become famous "Nothing is lost with peace, everything can be lost with war." The Pope is shown blessing the faithful and turning away from the scourge of war in his desire to end the Second World War. The heavy cloak represents the heavy weight of war, and also symbolizes the cloak of his protection that he extended to countless refugees during the war. 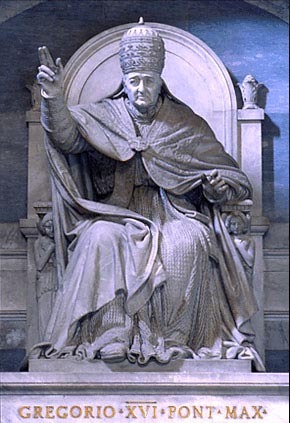 There is an unfortunate campaign, at present, to defame the good Pope's memory. It is an effort that flatly denies certain historical facts and that scorns the testimony of so many witnesses who lived during that dark time. 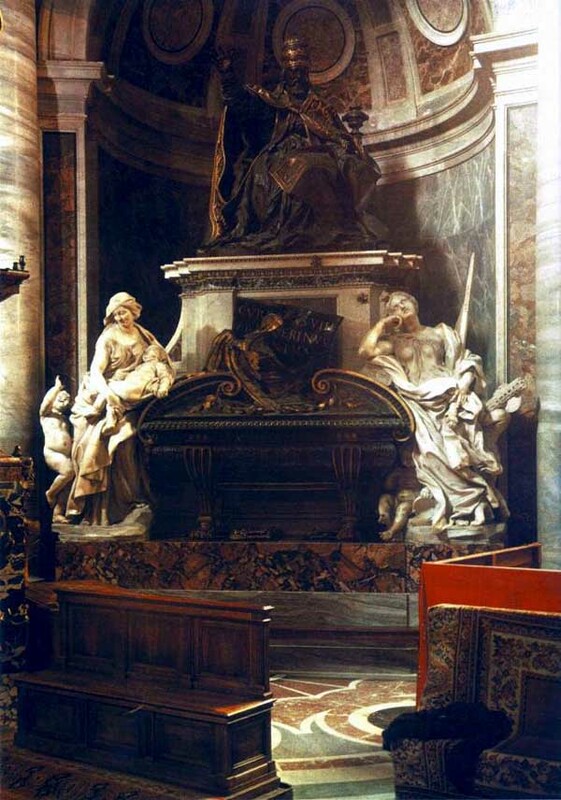 Eugenio Pacelli, who would later become Pope Pius XII, wrote Pius XI's encyclical, 'With Burning Anxiety' that was smuggled into Germany and read on Palm Sunday in 1937, one of the Papacy's most stinging criticisms of a political regime in modern history. A few examples of his actions as Pope Pius XII: he ordered thousands of false baptismal certificates to be prepared in Turkey to smuggle Jews out of Europe. Hundreds of convents and monasteries in Rome, and the Vatican itself, hid thousands of Jews during the war. 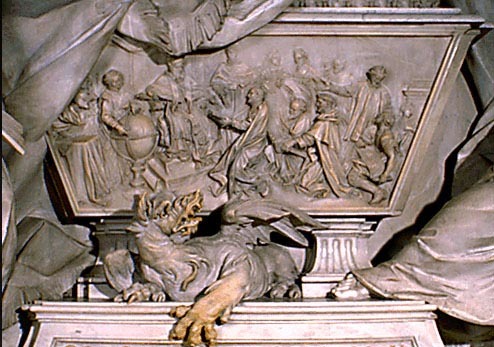 The Papal coat of arms was placed over the Roman Synagogue to make it Vatican property and so to protect it from confiscation and desecration by the Germans. When the Catholic Church did explicitly condemn the Nazi regime - in Holland in July, 1942 - Jews and prominent Catholics alike (especially priests) were rounded up and sent off to concentration camps. Eighty percent of Dutch Jews died in Hitler's slaughterhouses. In contrast, eighty percent of Italian Jews survived the war. This may help explain why the Pope played his cards very carefully. After the war, the diplomat Pinchas Lapide (who served as Israeli consul in Milan and interviewed Italian Holocaust survivors) declared that Pius XII "was instrumental in saving at least 700,000, but probably as many as 860,000 Jews from certain death at Nazi hands." 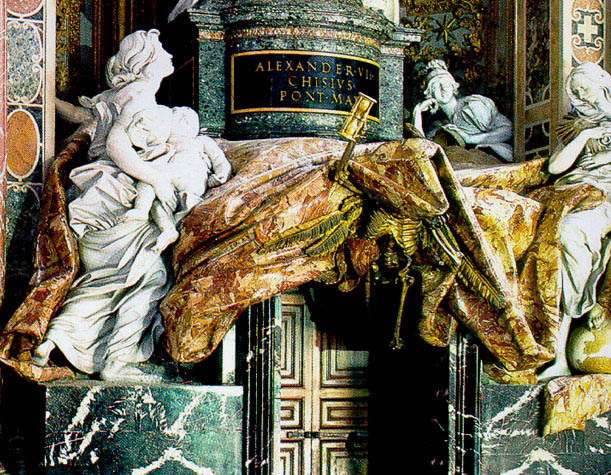 The figure of Pope Pius XII is represented in an essential and rigorous manner. 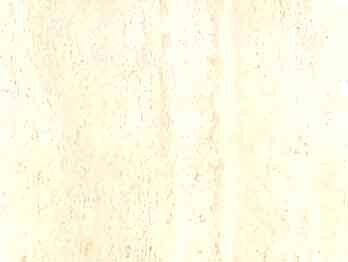 The expression of the face, with peaceful lines, is characterized by a strong expressive intensity. This is an interpretation of the personage, in perfect harmony with his austere personality. 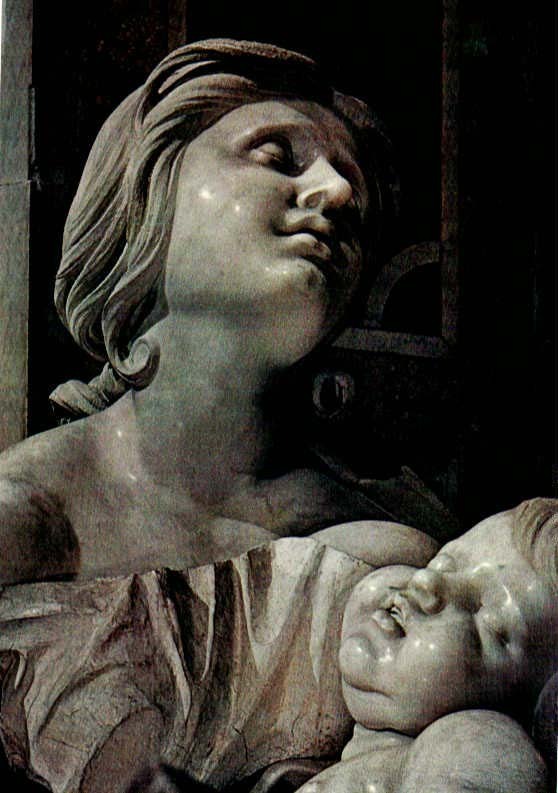 From a stylistic point of view, a penetrating luminarism flows vibrantly from the face over the entire uniform surface of the body, from which only the gesture of the blessing hand emerges from the compact mass. 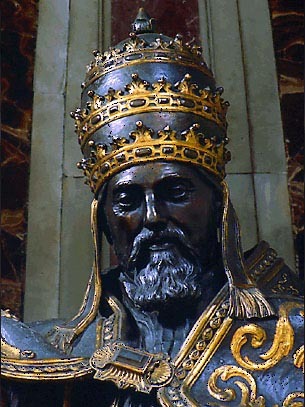 The work was preceded by two small bronze statues used to prepare the entire figure, which are preserved in the Vatican Collection of Modern Religious Art.